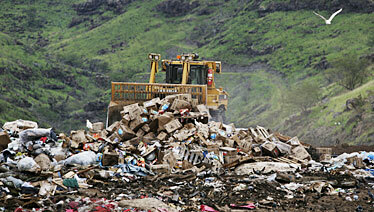 A vehicle compacts trash dumped at Waimanalo Gulch Landfill. In a 6-1 vote yesterday, the city Planning Commission voted to advance a request for a two-year permit extension for Oahu's only landfill. Panel members complained the city administration forced their decision with the late timing of the request. A city panel approved yesterday a request to keep Waimanalo Gulch Landfill open for an additional two years, with some members chastising the city administration for essentially leaving them no choice by waiting until the last minute to seek the change. After deliberating behind closed doors for an hour and a half, the city Planning Commission voted 6-1 to advance a two-year permit extension for the island's only landfill. "We are extremely disappointed with the (city) Department of Environmental Services for the timing of this petition," said Karin Holma, the commission's chairwoman. "We really didn't have a choice. If we did not go in favor of this, the landfill will close on May 1, 2008. That presents, in my opinion, huge catastrophic problems." The commission listened to arguments from the city corporation counsel, Senate President Colleen Hanabusa and the Ko Olina Community Association in a contested hearing, similar to a trial. Holma said Hanabusa and Ko Olina's case would have been bolstered if experts had testified on the safety hazards of the landfill. Many commission members, who are appointed by the mayor, said they feared closing the landfill with no other alternatives to dispose waste would create a serious public health risk for all Oahu residents. "We felt we were in a very uncomfortable situation because of the timing of the whole matter," said Commissioner Rodney Kim. "The message we want to convey to the administration is that they need to get this problem solved." Holma added that the panel's decision might have been different if there were more time before the permit expired. The panel added a condition that the city must obtain a permit from the state Department of Health raising its height restrictions before the extension is granted. Waste in the landfill exceeds the height allowance, and the city is in the process of obtaining a state permit that would put it into compliance. Beadie Dawson, the lone dissenter on the panel, attempted and failed to place other conditions, including requiring the city to ship out waste and conducting studies for other landfill sites. "It is necessary to force city officials to stop delaying these projects," Dawson said. Eric Takamura, director of the Department of Environmental Services, was not available for comment after the panel's vote. Mayor Mufi Hannemann's spokesman, Bill Brennan, said the city did not intend to request a permit extension, but faced several setbacks. Some stones, believed to be native Hawaiian artifacts, were found during an environmental impact study that was supposed to be completed last month. A draft of the report is expected to be published in March, said Takamura's executive assistant, Martin Okabe, before the city pursues a 15-year expansion of the landfill. The permit application goes to the state Land Use Commission, which has the final say. Some opponents of Waimanalo Gulch said they believe hearings before the state panel will be a tougher fight. The next tentative date for a state Land Use Commission meeting is next Thursday. Hanabusa, who lives in Ko Olina, said she is considering appealing the decision and might call for a court injunction to stop the proceedings before the state panel.